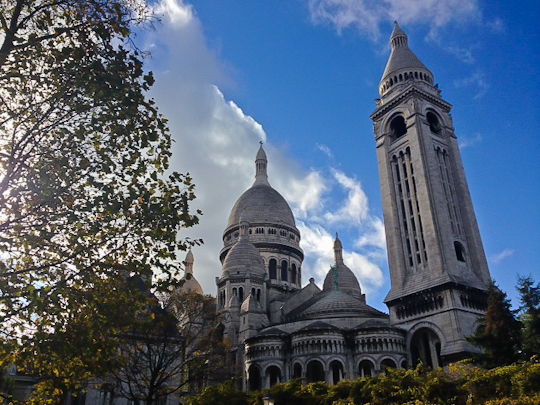 Earlier this month, I was invited by Discover Walks to join one of their Paris walking tours. 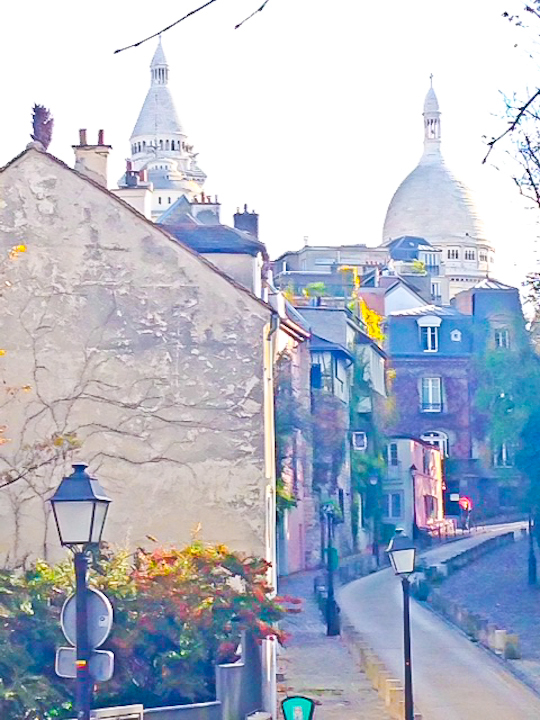 I chose the Montmartre and the Impressionists tour because I was not as familiar with this neighborhood as I am with some of the other parts of the city where they conduct tours. We met our guide, Guillaume, at metro Blanche in the 18th arrondissement, just outside the famous Moulin Rouge cabaret. He was easy to pick out with his demonstrative pink vest. 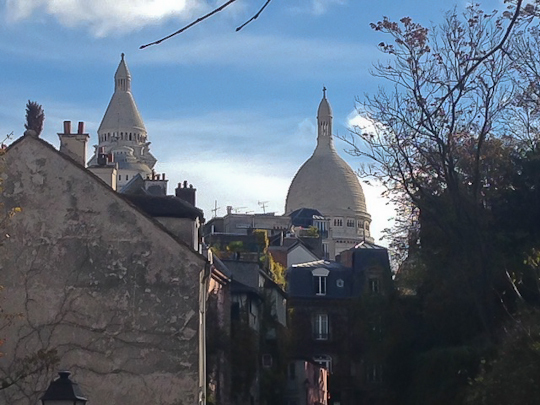 For about two hours, we toured the back streets of the Butte de Montmartre. Guillaume is fairly new to the tour guide business, but between his deep knowledge of and enthusiasm for the neighborhood and his ease in connecting with visitors, I never would have known he was a novice had I not asked. In fact, Guillaume was born and raised in Montmartre, so not only did he know the facts well, he was also able to include personal anecdotes and local legends not recorded in any history books. We visited the sites of buildings where many of the famous artists and other notable residents lived at one time, many back when Montmartre was just a village in the suburbs of Paris. 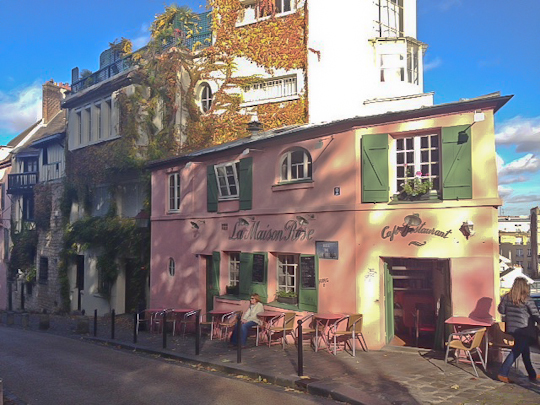 We caught a glimpse of the Montmartre of today, including our guide’s favorite cheese shops and the café of Amélie fame. But this was not just a tour of a collection of landmarks. Guillaume presented a story, the history of a community and of a culture, and repeatedly tied new information back to the history he had presented earlier in the tour. The presentation of the tour was clearly very well thought out. We ended the tour at Guillaume’s favorite Sacré Coeur-viewing spot. I won’t give it away–you’ll have to take his tour to find out where it is! Because Discover Walks aims to present a story and not just point out the various sites, they include in the price of the walking tour a skip-the-line ticket to the Musée d’Orsay (valid for a year), along with a packet of other useful tips and discounts that they give each guest at the end of the tour. The one downside? The tour is not cheap at €40 or U.S.$54 for adults. But remember, this includes the €11 Musée d’Orsay entrance and most importantly native insider information you cannot find anywhere else. Other Paris Adventure walking tours include a Night Tour, a Photo Tour, a Cooking Class, a Flea Market Tour and much, much more. Discover Walks is dedicated to helping you experience Paris and not just see it as an outsider. 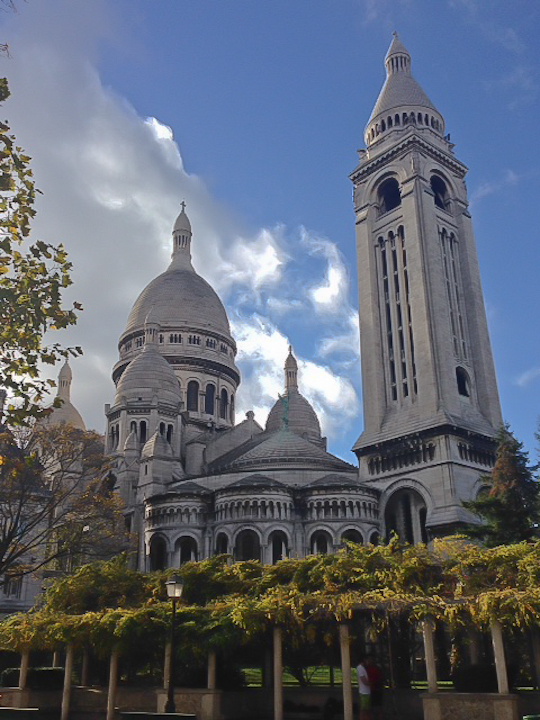 If the price is too high for your budget, Discover Walks does offer free tours in a number of neighborhoods, including Montmartre. These free tours run every day except December 24th and 25th, rain or shine. Of course, they are not entirely free, rather tip supported. The website indicates that the average tip is €12 per person, so it’s still a fantastic deal for a 1 hour 40 minute or so tour given by a native. The free tours are generally limited to about 20 guests, while the Paris Adventure tours are generally limited to groups of 10 to 12. You will need to reserve in advance for the Paris Adventure tours; you may reserve the free tours online or just show up at the designated meeting place. If you try one of the other Discover Walks tours, I’d love to hear how it goes!